In part 1 of this series on How to be Mindful of Thoughts, I showed you how to deal with all those thoughts zinging through your mind while meditating, and I explained that the secret to working with thoughts was to treat them as what they are: just mental objects that can be observed. But sometimes thoughts will arise that have a really heavy emotional payload. It can be difficult to treat these kinds of thoughts as just mental events. That’s the focus of part 2 of this series: how to deal with thoughts that tend to overwhelm you with their emotional charge. Watch part 2 below. If you liked this video, you may want to have a look at part 1 and part 3. P.P.S. If you prefer reading to watching videos, I’ve included the full transcript below (but you’re missing out on some amazing low-budget CGI effects =-) ). 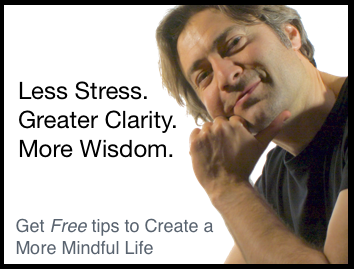 Last time, I showed you how to deal with all those thoughts zinging through your mind while meditating, and I explained that the secret to working with thoughts was to treat them as what they are: just mental objects that can be observed. Now, sometimes, thoughts will arise that have a really heavy emotional payload. It can be difficult to treat these kinds of thoughts as just mental events, observe them objectively, and avoid getting sucked into their content. In this kind of situation, you may begin to feel overwhelmed by the thoughts as you try to observe them. When that happens, it’s a good idea to change tactics a bit, until you can recover your objectivity. The first thing to do is to switch your focus from the thoughts themselves, to the physical sensations that arise in conjunction with the thoughts. Notice where these physical sensations are located, what they feel like, how long they last, and so on. This will help you to disengage from the emotional content of the thoughts and help you to reestablish some equanimity. If that’s enough for you to regain your balance, then you can go back to observing the thoughts again, switching your focus to their associated physical sensations whenever you feel you need to. If paying attention to the physical sensations like this isn’t enough for you to regain your composure, then it’s time to switch your attention to some other neutral or even pleasant physical sensation that’s easy for you to pay attention to, such as the breath. Hang out there until you’re regained your cool. Then, when you feel ready, you can go back to paying attention to the physical sensations associated with the thoughts, and then gradually focus on the thoughts themselves. Working with emotionally charged thoughts in this way is kind of like a dance. Use your mindfulness to tell you when you’re starting to lose your equanimity, and then take appropriate action before that happens. And you don’t need to limit this approach to periods of formal meditation. You can do this anytime you find yourself being distracted by thoughts. Believe me, I get it! Probably the last thing you want to do is go through the ordeal of hanging out with these kinds of emotionally intense thoughts. But here’s the counterintuitive secret: if you can just observe these thoughts mindfully, stay with them without reacting to them, without trying to get rid of them or change them in any way, then you will discover something remarkable about them. They don’t last. It may seem totally obvious that thoughts are transient, but here’s the thing. While you’re sucked in to the content of your thoughts, you don’t remember this simple fact. You’re lost. And it seems like the thoughts are your entire world, and like they’ll continue forever. But they don’t. And if you can stay our of their content, and observe them as just mental objects, you’ll see them arising and passing away, all on their own. Once you’ve seen this for yourself enough times, even the emotionally supercharged thoughts will begin to lose their power. So when the memory of the argument you had with your partner resurfaces for the hundredth time, you’re not instantly sucked in. There’s a slight pause. And in that mindful pause, you can let the thought pass away without reacting to it. Of course, that memory will come up again, and again. But each time you don’t react to it, and let it pass away on its own, causes the pull of the thought to weaken. It starts to become, “oh, there’s that boring memory again about that argument we had eons ago”. Now you’re free. The thoughts that used to torment you are no longer a big deal. Eventually, they may even stop coming up. That’s it for this video. 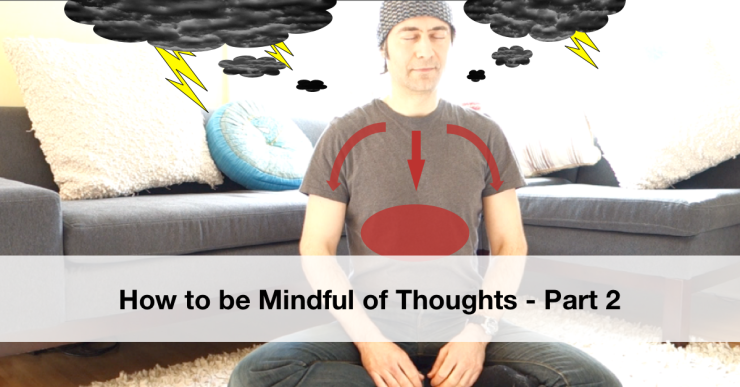 Next week will be the third and final video in my three part series on how to be mindful of thoughts. In the last video, I’m going to show you how to go even deeper and work with the moods and other states of mind that underlie the thoughts you’ve been observing in the first two videos. Make sure you subscribe to my channel, so you don’t miss it. I’m Nick Grabovac, Thanks for watching. I found this video very helpful, too. I will now follow-up with part 3. Where does one find the 30 days of mindfulness?